Our MPN community is in the middle of an historic upheaval. The pace of advance in genetics, in scientific research, is matched by the explosion of clinical trials. We are suddenly visible. The medical community notes our emergence in commentaries, studies, papers. Drug companies nod to our demands, deflect research dollars to MPNs and sponsor clinical trials to test new drugs that will be used by our hematologists. No longer a silent, suffering orphan disease, united we are a vocal, empowered international band rattling the gates of a cure. Reaching out to each other. 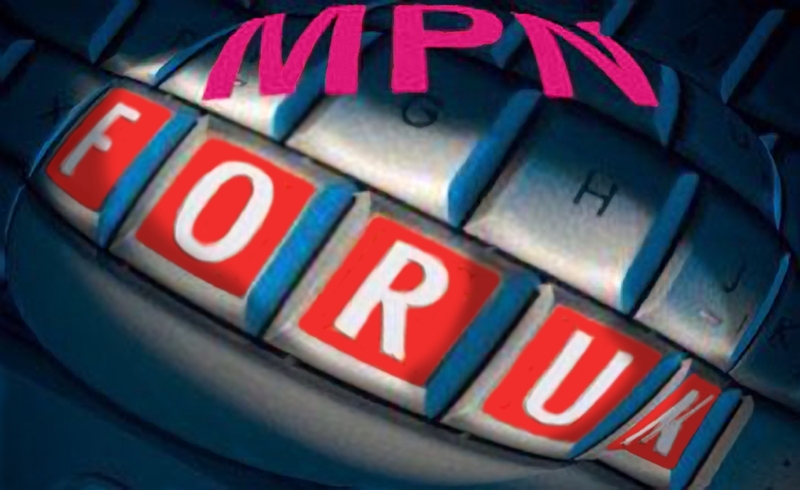 MPNforum was born only two years ago. In that short time we’ve seen revolutionary scientific and clinical breakthroughs that are today relieving our pain, extending our lives.There’s much more in the pipeline. Together, we are empowered to keep pressure on the scientific and medical process that is our ultimate hope for a cure… and spread the word to MPN patients, caregivers, and health providers worldwide that there are therapeutic responses to MPNs. On the way to a cure, there is help available right now! Ours is not a victory without casualties. Some of us have fallen, others are struggling with wounds this day but none need fall or suffer silently and all advance the cause of a full MPN cure. We are not alone. Joining our ranks are hematology’s biggest guns. Through the MPNclinic the assembled experience and resources of the world’s foremost MPN specialists and institutions are at our side …The MPN Research Foundation is in our ranks blazing a trail to basic research with millions of dollars in funding….MPD Voice’s education and patient outreach are brothers and sisters in arms. Local patient support groups…MPN/MPD on-line e-mail lists… MPN Facebook and other social media all work to the same end. And now, together, we are on the offensive, attacking the #1 symptom suffered by blood cancer patients: Fatigue, the life-robbing evil cloud that steals our energy and our days. The Fatigue Project has been fairly launched with more than 1,000 of us joining in a preliminary mustering of resources. In coming days, with the help of Dr. Ruben Mesa, Dr.Robyn Emanuel, Dr. Claire Harrison and allies throughout the MPN world we will all have the opportunity to tackle the tough job of supporting the search for interventions, the means to relieve fatigue, through clinical trial. MPNforum is joining the battle on two fronts. We are launching the MPNforum Quarterly journal to provide a broader platform for full exploration of science, technology, profiles, and news. And introducing MPNforum Report, an expanded monthly round-up of digests, abstracts, photos, and news from our worldwide MPN community. But we can’t do it alone. We need support now to keep the momentum going. We need you to commit a small block of your time and a little bit of your money to join the struggle. Your money: March 21 we launch our annual Small Donation program. Same rules: Kick in anything from $5 to $100. Your total donations may not exceed $100 in calendar 2013. (Please, it’s time-consuming – and a little painful — to return well-meant donations exceeding that limit. When the need arises for supplemental project financing, we’ll send out the call, but small donations cover operations.) Look for the launch and the push the button when it pops up on your computer screen. We don’t need a lot of time or money. MPNforum has published on a shoestring, raising enough money to help cover the cost of supplies and minimal operating expenses, upgrade equipment and defray costs of investigative reports and events like the CR&T meeting and the ASH annual meeting. It’s always been a simple idea: We create and publish MPNforum together and keep it going with creative contributions and small donations we can all afford. * Last year’s campaign was based on the idea that you have to be crazy to pay for something free, crazy to volunteer your precious time writing for the magazine, managing patient lists. This year, we can add to that. You have to be crazy to think a bunch of high-priced world-class hematologists are going to volunteer to help us in a free Clinic, to research solutions to our Fatigue. You have to be crazy to think a pill is going to shrink your spleen, give you a new lease on life…Crazy to hope we can work together for a cure. You can get a jump on this year’s Small Donation fund-raiser. Here’s last year’s button. It still works. Just push a little harder.